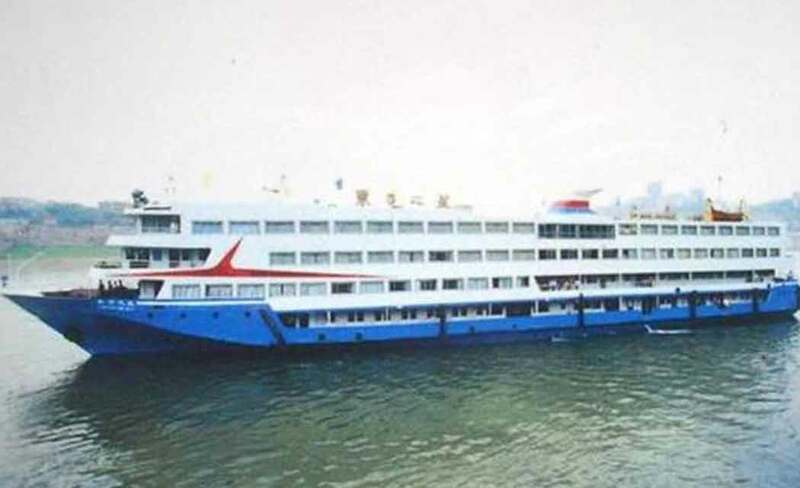 BEIJING (AP) _ A small cruise ship sank overnight in China’s Yangtze River during a storm, leaving at least one person dead and nearly 450 people missing, most of them elderly, state media said Tuesday. Ten people were rescued, the state media reports said. Search teams heard sounds coming from within the partially submerged ship about 12 hours after it went down and were trying to confirm whether they were from survivors trapped inside, state broadcaster CCTV said. Footage from the broadcaster showed rescuers in orange life vests climbing on top of the upside down hull, with one of them lying down tapping a hammer and listening for a response, then pointing downward. CCTV said the four-level ship had been carrying 406 Chinese passengers, five travel agency employees and 47 crew members. The broadcaster said 10 people were rescued and that one person was confirmed dead. The ship sank in the Damazhou waterway section, where the river is 15 meters (about 50 feet) deep, and drifted about three kilometers. The Yangtze is the world’s third-longest river and sometimes floods during the summer monsoon season. CCTV video footage of the river showed calm waters Tuesday morning, with dozens of rescue personnel in bright orange vests gathered on the shore. Several rescue ships were searching the waters, and divers had been deployed. The broadcaster said rescue personnel were trying to determine whether they could right the sunken ship. The Eastern Star measured 251 feet long (76.5 meters) and 36 feet wide (11 meters) and was capable of carrying a maximum of 534 people, CCTV reported. It is owned by the Chongqing Eastern Shipping Corp., which focuses on tourism routes in the popular Three Gorges river canyon region. The company could not be reached for comment. CCTV reported that 6 inches (150 millimeters) of rain had fallen in the region over the past 24 hours. Local media reported winds reached 80 mph (130 kph) during the accident.